This post was written by Hatchet reporter Christina Carpenter. The hordes of tourists have dwindled post-cherry blossom bloom so now’s your chance to snag a Capital Bike – or your roommate’s – and explore the District. Capital Bikeshare offers a number of membership fees ranging from $7 a day to a year-long pass for $75. The first 30 minutes of each trip are free and each additional half-hour adds an extra fee. If you’re looking to make a long-term investment, you can purchase a bike at local shops like The Bike Shop on 24th Street. Once you’ve picked your ride, abandon that boring path you bike every day. 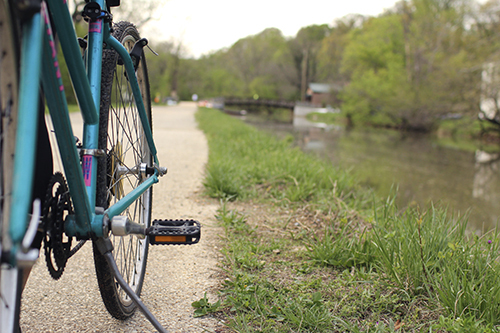 D.C. has more than 100 miles of bike lanes and trails you may never have cruised before. This 11-mile sightseeing trail follows an abandoned railroad from K Street in Georgetown to Silver Spring, Md., crossing through downtown Bethesda. The old rail was once used to transport lumber and provide coal for power plants. The trail is popular among walkers, joggers, bikers and rollerbladers. 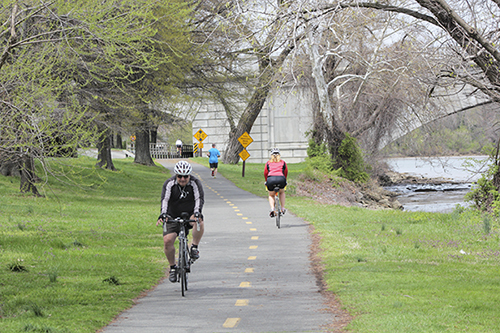 In fact, it’s the most heavily used rail trail in the U.S., according to its website. The last portion of the trail, which is still unpaved, will be rebuilt along with the Purple Line. You don’t have to go to Versailles to see a garden that National Geographic ranked in a list of the top 10 in the world. Dumbarton Oaks, located at the North end of Georgetown, is often compared to The Secret Garden with its fountains, mosaic tiles and rose bushes. In the spring, the gardens are open from 2 p.m. to 6 p.m. and admission is $8. The Dumbarton Oaks Museum is free and open from 11:30 a.m. to 5:30 p.m. The nearest Capital Bikeshare station is located two blocks from the museum. If you have a bike of your own, park it in the bicycle racks at the entrances of the garden and museum. Located along the Potomac River, Lady Bird Johnson Park is about three and a half miles from Foggy Bottom near the Pentagon. Although it is technically in the borders of D.C., it is closer to the Virginia side of the river. In the spring, the island is covered in blooming daffodils, tulips and cherry trees. The park is also home to two memorials: the Lyndon Baines Johnson Memorial Grove and the Navy and Marine Memorial.